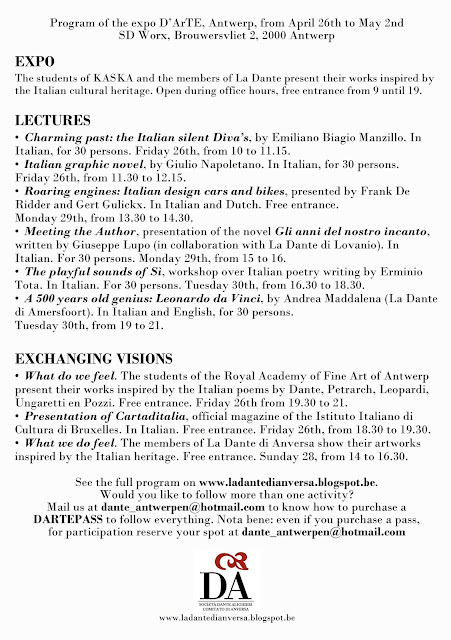 La Dante di Anversa: D'ArTE is on its way to you! Statistics suggest that Italian, worldwide, is the fourth most studied language. Some others state that it’s only the twenty-second most spoken language. But what does it mean most when the language we’re talking about is the evolving heritage of a strip of land where treasures grow up like apples on a tree? L’italiano is the language of art, from painting to poetry. Antwerp is a haven. What we are going to show you, is the result of a travelling inspiration. 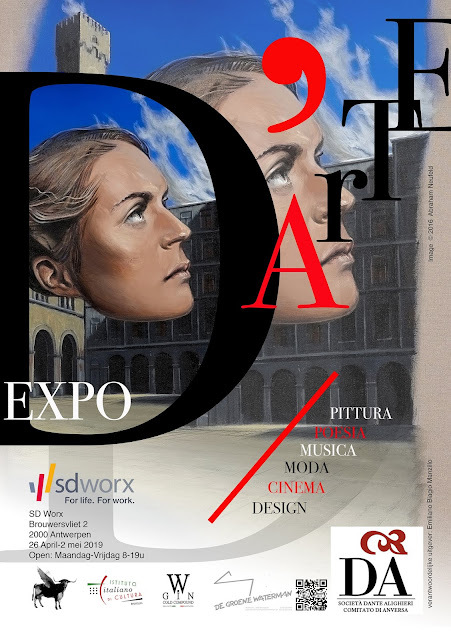 What you are going to see is D’ArTE, the expo resulted from the collaboration among La Dante di Anversa and The Royal Academy for Fine Arts of Antwerp. With the support of SD Worx, Istituto Italiano di Cultura di Bruxelles, De Groene Waterman and Lim Studio, La Dante di Anversa and The Royal Academy for Fine Arts of Antwerp present a week of exhibitions and meetings with Italian guests, to highlight facts, trivia’s, characters, words and images of Italy. A selection of works realized by the students of the Academy, as well as a selection of contributions from the members of La Dante, will surround the space. We are not in Italy, but we can try to see how much of Italy we can find here in Antwerp. 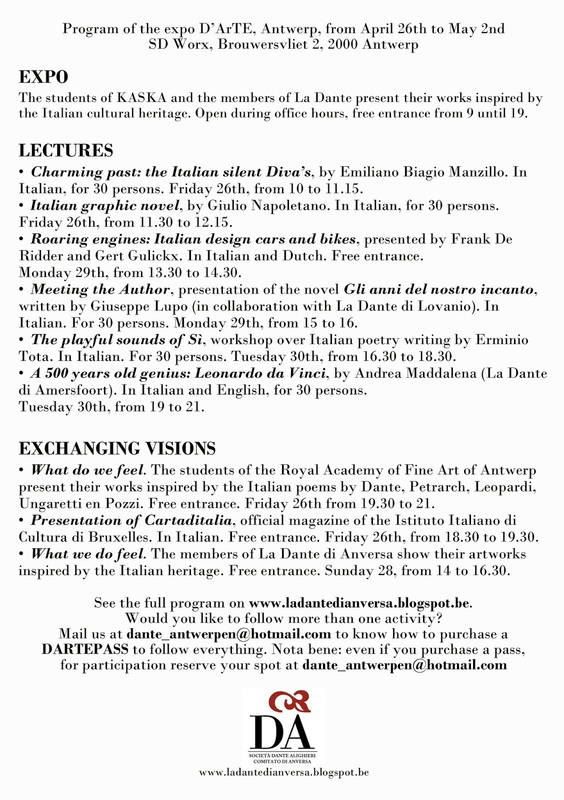 Following D’ArTE Expo from April 26th to May 2nd, at Brouwersvliet 2, 2000 Antwerp, you have the chance to admire new work of arts inspired by the poems of Dante, Petrarch, Leopardi, Ungaretti and Pozzi. There will also be short lectures to get to know the Diva’s of the Italian silent movies of the ‘10’s, the best authors of the Italian graphic novel, history and motors, from those who love Italy and Italian. Realizzatore: Raffaele Severi. Aggiornamento: Comitato della Dante di Anversa. Tema Fantastico S.p.A.. Powered by Blogger.